Every room in your house, decoded. Remember that dust and dirt settle. In each room, use a microfiber cloth to start at the top (ceiling fan blades, around the window trim), and work your way down. Floors are always the last thing to clean, so keep as much as you can off the floor as you work your way through the house in order to make the final step even easier. The occasional single dirty sock or craft project gone wrong will make itself known as you move through the house. Keep a contractor bag with you so you can collect these things as you find them. Wipe down the front of all kitchen cabinets using an all-purpose spray and rag. And you’ll want to make sure you wipe your antiques and servingware in the cabinets, too—they collect more than enough dust on their own. Cut the grease. For any spots that receive weekend splatterings of bacon, this technique will work on anything from tile backsplashes to your oven range. Soften the spots with a sponge and warm water. Next, use a spritz of distilled white vinegar and scrub thoroughly with a dish soap and water mixture. For glass shower doors, all you need is a squeegee, white vinegar, and water. Simply combine and wipe down. If you have a shower curtain, throw it in the washer (the liner, too!) and air dry. For future tub times, keep your door cracked to curb mildew buildup. Also, don’t forget to clean your drains, vanity, and medicine cabinet—there are tons of areas in the bathroom we should be cleaning, but don’t. Check out the full list of easy-to-miss areas here. Toss all fabrics into the wash. Curtains, removable throw pillows, and that blanket the dog loves. Give your trinkets some attention. Wherever you keep your books or cherished collections, this is a good time to remove them all and dust the surface they sit on. Wear a sock over one hand so you can dust them as you remove them. If you have a fireplace (working or not), soot and dust collects there, too: Be sure to use a combo of trisodium phosphate and bleach to give it a good scrub. Avoid using this time to declutter your closet. 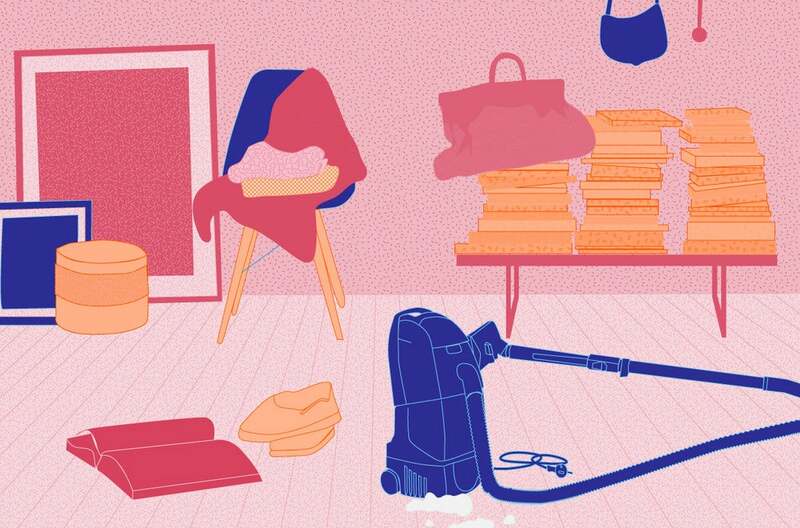 Instead, move everything off the closet floor for a dust and clean. Wash your pillows and comforter (see care instructions on their labels) for a full freshening up. Tired yet? Start at one end of the house, and run a microfiber mop on every floor. Return to where you started, and use a steam cleaning mop or bucket of floor-friendly surface cleaner to give everything a final shine (this is especially important for wood flooring). Make sure you finish at your front door, so you can skip out for brunch while the floors dry. Originally published on April 18, 2017. Updated with new information March 17, 2018.